For scalps prone to severe dandruff*. Get non-stop protection against severe dandruff*. Does your stressful and hectic schedule everyday lead to an increase in a greasy and itchy scalp? In times of stress, the body releases adrenaline and other chemicals that cause physical symptoms, including a dry, itchy scalp. CLEAR Extra Strength Shampoo is infused with Extra Lipid Booster Technology, effectively removes dandruff and provides 365 days protection for dandruff-prone scalp*. 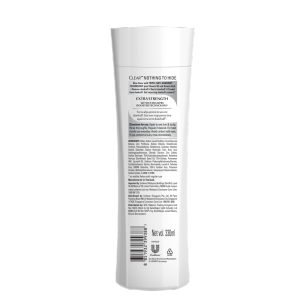 CLEAR shampoos are formulated with Triple Anti-Dandruff Technology to activate scalp to remove, resist and prevent* dandruff. End recurring dandruff*, for 100% confidence'. 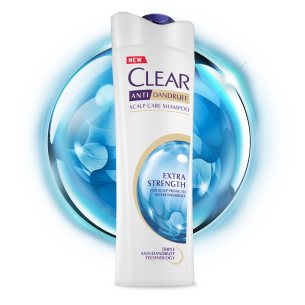 Clear's Lipid Booster is powered by Sunflower Oil which is known to nourish, repair and restore scalp.